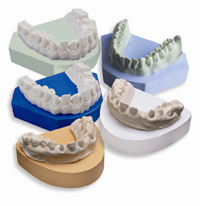 Dental gypsum is separated into 5 different categories of products, commonly referred to as TYPES. Knowing how the gypsum is to be used will determine which product (TYPE) you should use. The ISO rating is not strictly related to compressive strength, although it is one of the key criteria of the particular ISO designation. Another factor used to determine ISO type is the expansion. Where this is most obvious is the transition from type 4 to type 5. In the case of these ISO types, both require a minimum of 5,100 PSI. 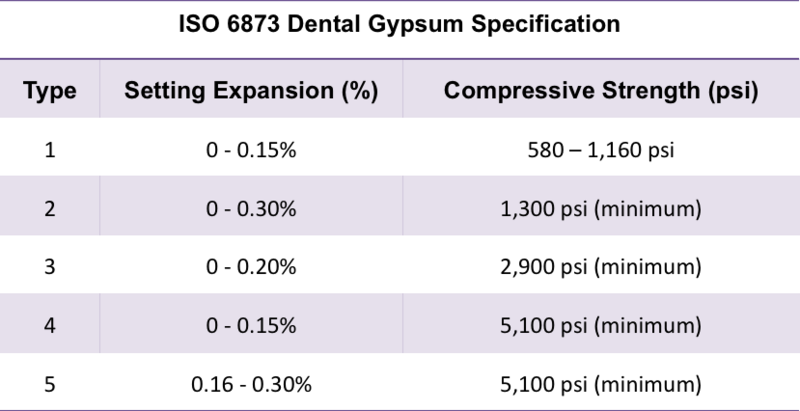 However, as is illustrated on the chart below, type 4 is 0-0.15% expansion. Whereas type 5 picks up at the 0.16% expansion all the way up to 0.30% expansion. These types are typically referred to as plasters. They are for general applications, like mounting models to articulators. Or, they can be used on diagnostic models which will not be worked on. 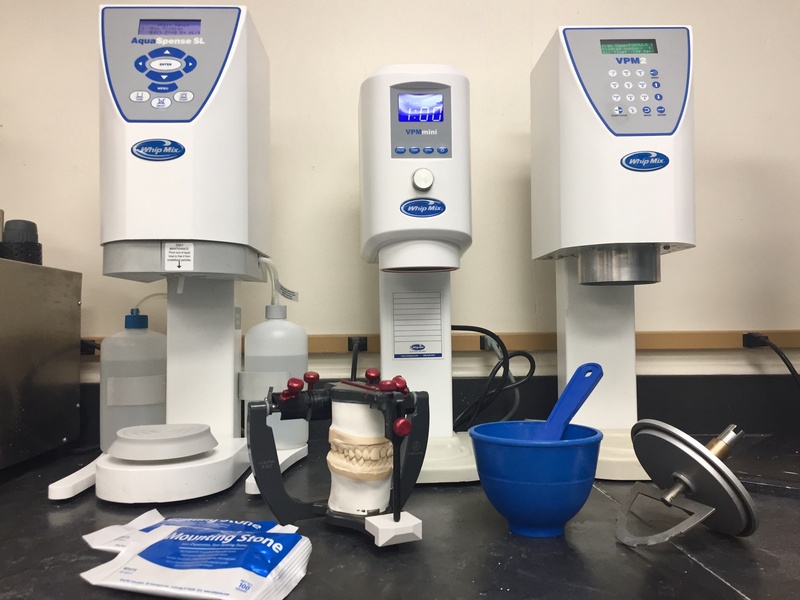 Type 1 and Type 2 gypsum or plaster come in ‘fast’ and ‘regular’ working times…the choice is based on the preference of the lab manager or technician. For models in the denture technique. Smaller expansion is best for crown & bridge applications and for implant work while as larger expansion is best for denture work. Gypsum with an ISO rating of 4 can be a specialty stone, or more commonly known as a die stone. Most cases are done using a low expansion die stone, with an expansion of around .08. If the casting fits the model, but is a little tight in the patient’s mouth, then it would be wise to switch to a larger expanding stone, in the .12 to .15 range. Type 5 gypsum is the high expansion die stones, beginning at .16 and going up. It is recommended to use this kind of gypsum when the Doctor is using impression materials that have a large linear contraction of .25 or greater, or when the Doctor wants a ‘loose’ or ‘passive’ fit in the mouth. With a though understanding of gypsum ISO ratings you can better choice a stone to fit your application.